#1. 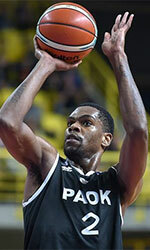 This week's number one is an international center Yanick Moreira (211-91, college: SMU, currently plays in Greece). He contributed to an easy victory against the 11th-ranked Aris (2-5) 95-79 in a derby game in the Greek A1 in Sunday night's game. Moreira recorded 6 points and grabbed 5 rebounds in 18 minutes on the court. PAOK Thessaloniki (2-2) is placed sixth in the A1. But this is still an early stage of the season and everything may happen. This year Moreira averages: 7.4ppg, 5.4rpg, 2FGP: 51.4% and FT: 60.9% in seven games he played so far. He is currently a member of the Angolan senior national team. #2. Second place goes to an experienced international guard Carlos Morais (200-85, agency: Duran International, currently plays in Italy). Morais led Mens Sana 1871 to a victory over the 15th-ranked FCL Contract LG (2-8) 87-72 in the Italian Serie A2 (second division) last Sunday. He was MVP of the game. Morais scored 17 points, had 5 rebounds and dished 8 assists. Soundreef Mens Sana 1871 Siena (6-3) is placed fourth in West group. But the season just started, so everything may happen. Morais has individually a very good year with high stats. He averages: 17.9ppg, 5.8rpg, 2.9apg, 2FGP: 47.8%, 3FGP: 44.1% and FT: 86.4%. Morais has a dual citizenship: Angolan and Portuguese. He is in the roster of the Angolan senior national team. #3. The Angolan player who performed third best last week abroad was an international center Julio De Assis (203-92, currently plays in Spain). De Assis was the main contributor in Univ.Burgos' victory against the 11th-ranked Univ.Valladolid (2-6) crushing them 96-65 in the Spanish EBA (fourth division) on Saturday night. He was the best player in that game. De Assis scored 33 points (!!! ), grabbed 6 rebounds and dished 3 assists in 32 minutes. CB Universidad de Burgos (7-1) is placed second in Group A-A. But the season is still in it's first stage and everything can happen. De Assis has very impressive stats this year: 20.1ppg, 8.4rpg, 3.0apg, 1.4spg, 2FGP: 64.5%(49-76), 3FGP: 47.6%(10-21) and FT: 78.6% in eight games. He is another player who holds two passports: Angolan and Spanish. De Assis is also a member of the Angolan senior national team. #4. Forward Bruno Fernando (208-98, currently plays college basketball in the States), who plays in the NCAA could not help the Maryland in their last game on Wednesday. Despite his good performance his team was defeated 76-71 on the road by the The University of Virginia. Fernando recorded a double-double by scoring 14 points and getting 11 rebounds. He also added 2 blocks. This season Fernando has very high stats. He averages: 15.4ppg, 10.0rpg, 1.1apg and 2.3bpg. Fernando used to play for the Angolan national team back in 2016. #5. Former University international forward Jose Miguel (185-85, currently plays in Portugal) contributed to a 3-point Electrico FC's victory against the eighth-ranked Estoril Basket (0-7) 66-63 in the Portuguese Proliga (second division) last Saturday. He was the top player that evening. Miguel scored 15 points and grabbed 4 rebounds in 32 minutes. Electrico FC (4-3) is placed fourth in South group. It was his team's third consecutive victory in a row. It's Miguel's first season with the team. This year his overall stats are: 5.5ppg, 2.0rpg and 1.5spg in two games. 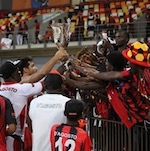 Miguel used to play for the Angolan university national team eleven years ago. #1. Experienced Benedito Suca (196-F-84, currently plays in Portugal) was the major contributor in Academia's victory against the fifth-ranked Angrabasket (3-4) 88-78 in the Portuguese Proliga (second division) on Sunday night. He recorded 21 points and grabbed 9 rebounds. Academia do Lumiar Lisboa (5-2) is placed third in South group. Suca is one of the most experienced players in a team as it's his eighth year in Academia's roster. Suca has relatively good stats this season: 13.9ppg, 5.4rpg, 1.1apg and 1.1bpg. #2. Paulo Sopita (203-PF-93, currently plays in Japan). He could not help Iwate Big Bulls (3-13) to beat Saitama Broncos (7-9). Sopita cannot count it as his best performance. He scored only 2 points in 11 minutes. Iwate Big Bulls were crushed 81-52 at home by the higher-ranked (#4) Saitama Broncos. It was Iwate Big Bulls' eighth consecutive loss in a row. But there are still lots of games to play and it's a long way to go. This year Sopita's total stats are: 1.2ppg and 3.1rpg in 18 games he played so far. #3. Edson Ferreira (183-G-86, currently plays in Portugal) managed to help Electrico FC to win against the eighth-ranked Estoril Basket (0-7) 66-63 in the Portuguese Proliga (second division) last Saturday. He scored only 2 points. Electrico FC (4-3) is placed fourth in South group. It was his team's third consecutive victory in a row. Ferreira's total stats this season are: 0.5ppg, 1.5rpg and 1.3apg. #4. Fabio Galiano (202-PF-97, currently plays in Germany) was not able to help Itzehoe in their game against Sixers (7-4) in the German ProB (third division). He scored 6 points and grabbed 5 rebounds in 23 minutes. The ninth-placed Itzehoe (5-6) was edged 75-74 on their home court in Itzehoe by the higher-ranked (#3) Sixers in the North group. This year Galiano's total stats are: 5.3ppg and 3.9rpg in 11 games.